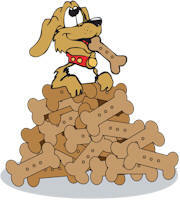 DIY - Dog Treat fundraiser! we go to grocery store and buy some natural dog treats (the ones we get are heart-shaped and pretty unique) and put 10-15 depending on size in zip-lock plastic bags and put them inside the containers. We end up with less than $2.00 in each container and we sell them for $10. We have lots of teens and pre-teens who are willing to do fundraisers for us, so we have them take about 25 of them and set up in front of different stores or during different community events. If the teens are pretty good at talking to people, they usually end up selling most or all of them, so it’s a very easy $150-200 bucks (net), plus it helps to get your name out to more people.